A number of Palestinian youths were wounded on Friday during clashes with the Israeli military forces in southern Bethlehem, in the south of the occupied West Bank. Palestinian sources reported that the Israeli soldiers fired tear gas and stun grenades towards the Palestinian civilians during the clashes that erupted in al-Khader village south of Bethlehem, causing some of them to suffocate. Israeli occupation forces (IOF) also suppressed a peaceful march launched from Ma'sara village, south of Bethlehem, in condemnation of the occupation repressive policies against the Palestinian prisoners. Mohammed Briggah, the media spokesman for the Popular Committee against the Wall and Settlements in Bethlehem, said that the Israeli soldiers attacked the marchers and prevented them from reaching the separation wall. Meanwhile, dozens of citizens and foreign peace activists suffocated from gas inhalation during the suppression of Kafr Qaddoum's march organized in condemnation of the killing of prisoner Abu Hamdiya and the occupation repressive measures against the Palestinian people and prisoners. IOF also arrested 4 citizens in violent clashes that broke out in the village of Isawiya in occupied Jerusalem, after storming the village. Local sources said that the forces sprayed wastewater to disperse demonstrators who responded by throwing stones at the soldiers. The Change and Reform parliamentary bloc, affiliated with Hamas movement, called on the Palestinians in the occupied West Bank to continue to confront and resist the occupation. The parliamentary bloc has demanded, in a statement it issued on Friday, PA's security services "to halt security coordination with the occupation." It also called on the Arab and Islamic nation in general, and the Arab Spring countries in particular, to support the Palestinian people, and demanded the Arab and international human rights institutions to intervene and take action to stop the Israeli crimes against the Palestinian people. President Mahmoud Abbas said that Israel is fully responsible for the escalation in the West Bank by destabilizing security through the killing of peaceful protesters. 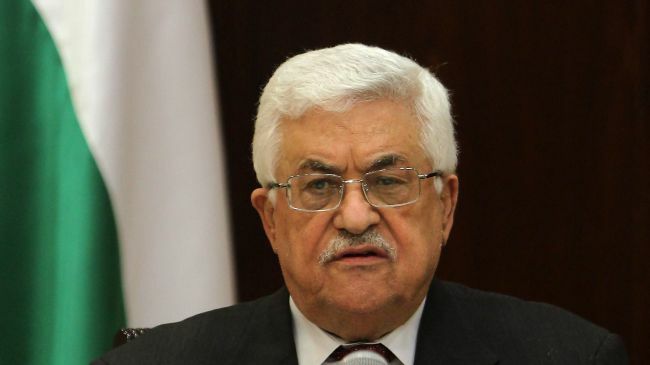 Abbas said in a statement during Fatah's Revolutionary Council meeting that Israel seems to be seeking to start chaos in the Palestinian Territory because "it's not possible that peaceful protests produce two martyrs, God knows what will happen later!" He said that such practices indicate that Israel seeks to escalate the security situation because "if it was concerned with security and relations it wouldn't have used force against protesters." On the killing of two teens in Tulkram on Wednesday and the death of prisoners in Israeli jails, Abbas said that Israel is responsible for what is happening today, tomorrow and the day after. He commented on what has been circulating in Israeli media on the possibility of the outbreak of a third Intifada, saying: "It seems that they want the situation to get to that point! It seems that they want to evade from their written obligations!" Abbas said that despite of the Palestinian Authority's commitment to security and stability, Israel uses excessive force against peaceful Palestinian protesters and suppresses peaceful protests, "which is not acceptable at all." "It seems that they don't want to achieve any step towards peace and don't wish to implement any step from the steps they committed to and this is the result," said Abbas. Violent clashes broke out on Thursday at the entrance to Aroub refugee camp northern al-Khalil and in the city of Nablus in the West Bank between Israeli occupation forces and Palestinians protesting death of Maysara Abu Hamdiya in custody. Israeli soldiers fired a barrage of tear gas towards young people, who demonstrated in protest against Abu Hamdiya's death, leading to the outbreak of clashes between the Palestinian youths and IOF soldiers who burned a house belonging to Jawabra family at the entrance of Aroub camp, local sources revealed. The sources pointed out that IOF troops deliberately fired tear gas towards the camp's alleys and homes, causing large number of suffocation cases. Clashes have also broken out on Thursday in the city of al-Khalil and its surrounding areas, specifically in Bab al-Zawiya area and the town of Halhul. Violent clashes erupted in Bab al-Zawiya after burying the martyr Abu Hamdiya, where hundreds of Palestinian youths stoned the Israeli forces in protest at the Israeli policy against the prisoners, eyewitnesses told the PIC reporter. Other clashes broke out near the entrance to the town of Halhul, north of al-Khalil, causing breathing problems among the youths, the sources added. 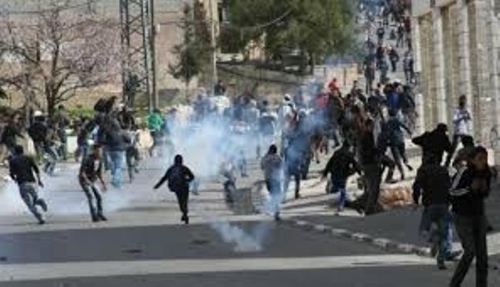 In the same context, confrontations took place between Palestinian youths and the Israeli soldiers at the Hawara checkpoint near the village of Burin, south of Nablus, where soldiers fired rubber bullets and tear gas towards the youths, leading to breathing difficulty among dozens of young men. Palestinian youths confronted Israeli military jeeps at the eastern entrance of the village, throwing stones towards the soldiers, while Israeli soldiers fired tear gas at them and some of the houses, leading to dozens of injuries, eyewitnesses said. 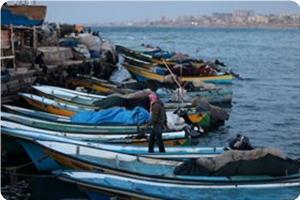 Israeli navy gunboats opened heavy machine gunfire at Palestinian fishing boats off the coast of Gaza at dawn Thursday. A field observer told the Quds Press that the Israeli gunboats targeted Palestinian fishing boats and fired flare bombs, but no casualties were reported. Israeli navy routinely targets Palestinian fishermen in line with its siege on the Gaza Strip and in violation of the calm agreement concluded with Palestinian resistance factions under Egyptian patronage last November. Around 3,500 Palestinian fishermen work on more than a thousand fishing boats as their sole source of living for their families that number around 50,000 individuals. The acting Palestinian Authority Chief, Mahmoud Abbas has said Israel is provoking a third Palestinian Intifada (uprising) by using "excessive force" against protesters. 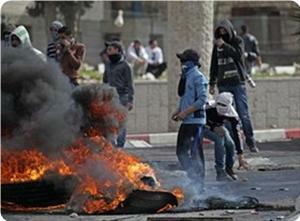 Israel "wants the situation to reach the point of a third uprising," he said on Thursday, DPA reported. 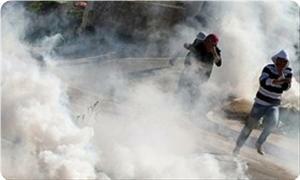 "If it cared about the security situation, it would not have used excessive force against the protesters," Abbas said. A total of 6,200 Palestinians died during the first Intifada between 1987 and 1993 and the second one in 2000s, which were both fiercely confronted by Israel. Hours before Abbas’ remarks, the body of a 17-year-old teenager, identified as Naji Balbisi, was found in the West Bank. 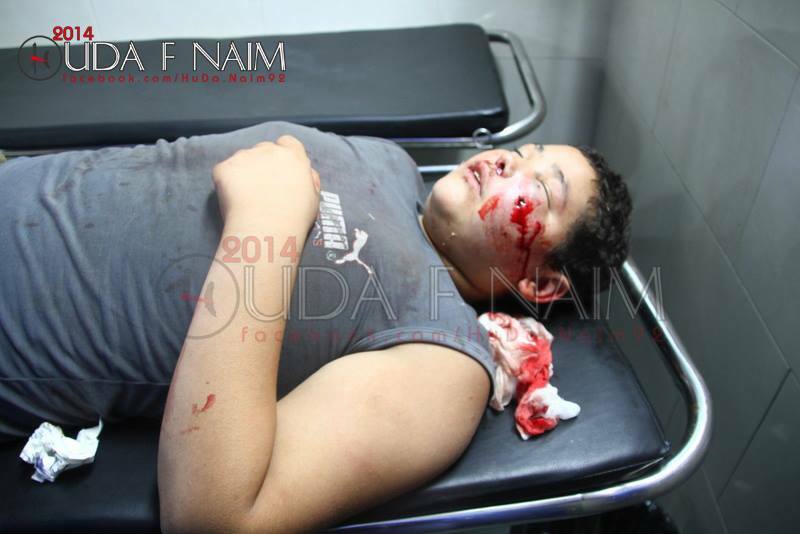 The boy was fatally shot by Israeli forces during recent clashes near the city of Tulkarm on Wednesday. 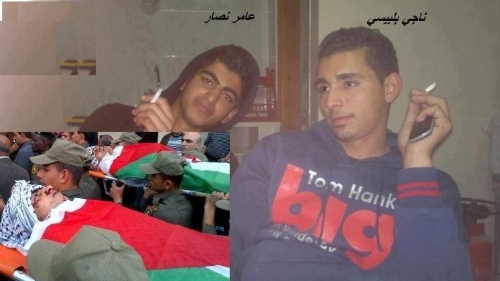 Balbisi was identified as the cousin of Amer Nassar, another 17-year-old killed by Israelis in the same clashes. The clashes came as Palestinians in the occupied territories protested against the death of Maisarah Abu Hamdiah, a cancer-stricken inmate, who lost his life in an Israeli jail on April 2 due to the lack of medical care. 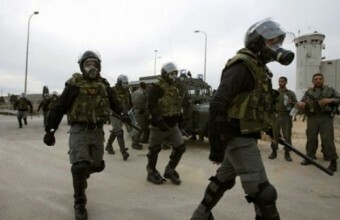 dozens of Palestinians suffered from suffocation due to tear gas inhalation, including children, women and elderly, during confrontations that erupted with Israeli soldiers in the village of Romaneh, west of Jenin. Local sources told Palestinian official news agency WAFA that soldiers raided the house of 24-year-old Palestinian prisoner Shadi Sbaihat, as well as his brother's and father's houses, searched them, destroyed their contents and interrogated their residents, provoking the village residents who clashed with the forces. They added that forces fired tear gas canisters at the residents, as well as inside their homes, causing dozens of suffocation cases among them, including children, women, elderly, and a 30-year-old handicapped man. They were all treated at the village health clinic. Palestinian official news agency WAFA reported that Israeli Soldiers shot and killed two Palestinian teens during confrontations erupted near Tulkarm on Wednesday night; one of them died right away and the other was found dead the next morning, according to medical sources. Naji Balbisi and Amer nassar, both 17 from the town of Anabta, east of Tulkram, were shot during confrontations with Israeli soldiers at Innab checkpoint, near Tulkarm. Medical sources said Balbisi's body was missing for few hours after the clashes with the Israeli soldiers, during which soldiers fired live ammunition at the young protesters. Balbisi's body was found at dawn near a house within the area. This came only hours after Nassar was shot dead at the same checkpoint. Israeli soldiers shot Nassar directly in his chest with live ammunition and prevented anyone that attempted to help from reaching him; an 18-year-old was shot with live ammunition in his arm while trying to reach Nassar. In addition, Diya' Nassar was arrested by Israeli soldiers, for attempting to help Nassar. Nassar's body was held for an hour before Israeli soldiers allowed the Red Crescent crews from taking him to a local hospital in Tulkarm. Confrontations erupted across the West Bank following the death of Maysara Abu Hamdiya, who died of cancer while in Israeli detention due to medical negligence according to Palestinian charges. A Palestinian teenager was killed and at least three others have been injured by Israeli military fire during clashes that took place at the Ennab roadblock, east of the northern West Bank city of Tulkarem. Palestinian medical sources reported that the army fired rounds of live ammunition at Amer Ibrahim Nassar, 17 hitting him with multiple rounds in the chest causing instant death. 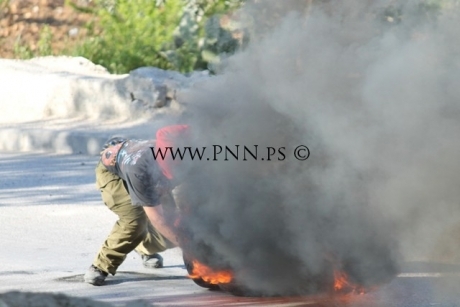 At least three Palestinians have also been injured. Furthermore, the army kidnapped three Palestinians identified as Naji Abdul-Karim Balbeesy, Dia’ Nassar, and Baha’ Naim Nassar; all from the nearby Anabta town.. The Israeli army claimed that the soldiers used live rounds after a number of youth hurled Molotov cocktails at them, no injuries were reported among the soldiers. Soldiers also closed the Ennab roadblock until further notice. Dozens of Palestinians have been injured, and kidnapped, over the past two days during clashes that took place in different parts of the West Bank following the death detainee Maisara Abu Hamdiyya, 64, on Tuesday. Israeli warplanes bombed on Tuesday night two areas in the east and north of the Gaza Strip, causing damage but no injuries. The raids were the first since Israel and Hamas agreed to a ceasefire under Egyptian auspices on November 21 to end an 8-day aggression on the Gaza Strip. PIC's correspondent said that two airstrikes hit Tuffah area in the eastern Gaza Strip, and farm land near the Bedouin village north of Beit Lahia in the northern Gaza Strip. He pointed out that the shelling caused no casualties, and added that the Israeli warplanes have continued to fly over Gaza, in a new breach of November truce. The bombing took place hours after the Hebrew media announced that two rockets were fired from the Gaza Strip towards Israeli targets in the western Negev in southern 1948-occupied territories, following the announcement of the death of prisoner Maysara Abu Hamdiya. 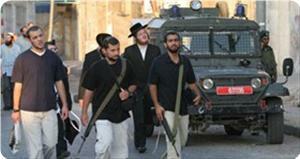 The Israeli army said the two attacks were in response to rocket fire from the Strip. None of the Palestinian factions claimed responsibility for the bombing. Israeli drone planes, late Tuesday night, fired two missiles targeting two locations in the Gaza strip. 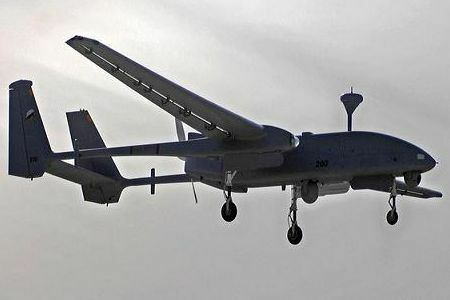 Witnesses said that Israeli drone planes fired two missiles targeting an agricultural land northeast of Gaza, in addition to another missile targeting an empty land east of the town of Lahya, north of the strip. Palestinian medical sources reported that two Palestinians have been injured and dozens have been treated for the effects of teargas inhalation, during clashes that took place between the residents and Israeli soldiers in Beit Ummar town, and the Al-Arroub refugee camp, north of Hebron, in the southern part of the occupied West Bank. The clashes started during morning hours in Beit Ummar and Al-Arroub, after the army attacked Palestinians protesting the death of detainee Maisara Abu Hamdiyya, 64, who died of an advanced stage of cancer due to the lack of adequate medical attention in Israeli prisons. Mohammad Ayyad, spokesperson of the Popular Committee in Beit Ummar, reported that the clashes are still ongoing, and that dozens of residents have been treated for the effects of teargas inhalation, while two Palestinians were shot by rubber-coated metal bullets fired by the army. Ayyad added that the army also attacked a funeral for a young Palestinian identified as Mahmoud Sleiby, and fired gas bombs at the funeral procession in addition to opening fire at the home of resident Habes Al-Alami and a storage that belongs to resident Fayez Abu Ayyash causing them to catch on fire. Ahmad Abu Kheran, coordinator of the Popular Committee in the Al-Arroub refugee camp, stated that most of the clashes in the camp took place at its main entrance and its center. 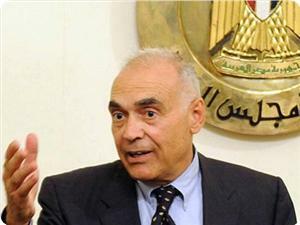 He added that the army seems to be deliberately targeting civilian homes with gas bombs during clashes in the area. At least fifty Palestinians have been injured during the ongoing clashes in Hebron and its nearby areas, since Tuesday evening. Israeli soldiers, attacked on Tuesday, a nonviolent protest that was held in the Old City of occupied East Jerusalem, and claimed that the protest was held without a permit from the Police in the occupied city. Local sources reported that dozens of Israeli soldiers and policemen were deployed in the city in an attempt to prevent the Palestinians from protesting the death of detainee Maisara Abu Hamdiyya who died at an Israeli prison due to medical neglect resulting in advanced stages of cancer. 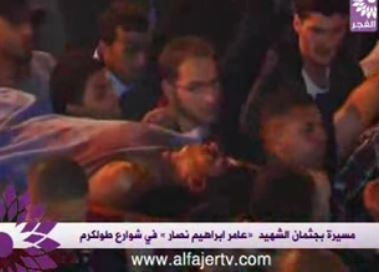 The soldiers violently attacked the protesters leading to clashes and a number of injuries, the sources added. 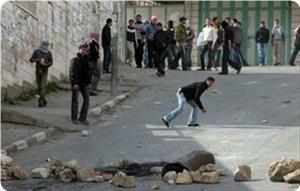 In related news, clashes took place in the Al-Khader and Toqua’ towns in the West bank district of Bethlehem. Furthermore, at least 40 Palestinians have been injured during clashes with the army in Hebron, in the southern part of the West Bank. 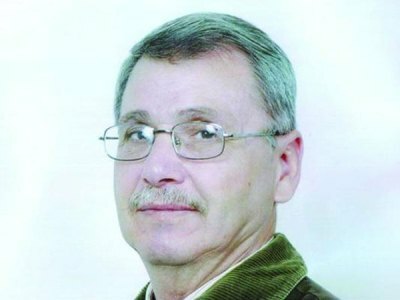 Detainee Maisara Abu Hamdiyya, 64, died at the Intensive Care Unit at the Soroka Israeli hospital on Tuesday morning suffering from an advanced stage of cancer resulting of medical negligence in Israeli prisons. Following his death, clashes took place in different parts of the occupied West Bank and the army used excessive force against the Palestinian protesters leading to dozens of injuries while several residents were also kidnapped and detained. Palestinian medical sources in Hebron, in the southern part of the occupied West Bank, reported that at least 40 Palestinians have been injured during clashes with Israeli soldiers who attacked Palestinians protesting the death of detainee Maisara Abu Hamdiyya. The Palestine News Network (PNN) reported that clashes took place in Bab Az-Zawiya neighborhood in Hebron, and that the soldiers fired dozens of gas bombs, concussion grenades and rubber-coated metal bullets leading to at least 40 injuries. Local sources reported that a number of Palestinians hurled 10 Molotov cocktails at the army, no injuries were reported. In related news, dozens of Palestinians have been injured during clashes with the army in Beit Ummar town, near Hebron, during clashes that took place at the entrance of the town. Yousef Abu Maria, spokesperson of the Popular Committee Against the Wall and Settlements in Beit Ummar, reported that the army fired dozens of gas bombs and rubber-coated metal bullets, and closed the main roads leading to the town. Dozens of Palestinians Tuesday clashed with Israeli soldiers during demonstrations in central Hebron, protesting the death of Palestinian prisoner Maysara Abu Hamdiya, who died due to medical negligence by the Israeli prison services, according to WAFA correspondent. Abu Hamdiya died on Tuesday morning in Israeli Soroka hospital after a long struggle with cancer due to deliberate medical negligence. He said that Israeli forces took over several roof tops of Palestinian-owned houses, firing acoustic and tear gas canisters, in addition to rubber bullets at the protesters, including students, causing several suffocation cases among them. 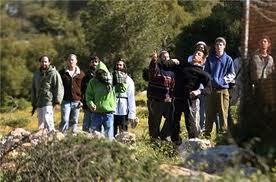 Forces also clashed with students in two different locations in the Hebron area. The Wadi Hilweh Information Center in Silwan, in occupied East Jerusalem, reported that a group of settlers attacked a Palestinian child in Ash-Sharaf neighborhood as he was heading to school, causing various injuries that required hospitalization. The center said that Sultan Al-Kiswani, 16, was walking from home to the Al-Rasheediyya school in Jerusalem when the settlers attacked him, and was moved to a local clinic before being moved to the Eye Hospital in Sheikh Jarrah. The center added that settlers attacks witnessed a serious escalation especially on roads the Palestinians use to reach the Al-Aqsa Mosque, and the markets of the Old City of occupied Jerusalem. A few day ago, the settlers attack several Palestinian schoolgirls in Silwan as they were walking back home, and threw trash at them. 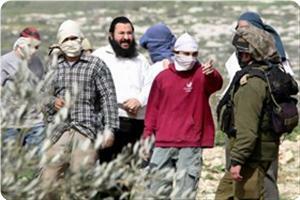 The settlers also attacked a woman that rushed to help the schoolgirls, and attempted to remove her hijab. Eight Palestinian school pupils were injured when Jewish settlers attacked their school buses on their return from a trip near Nablus city on Sunday evening. Ghassan Daghlas, an activist monitoring settlement activity north of the West Bank, said that a group of settlers ambushed two school buses near Yitzhar crossing, south of Nablus. He said that the settlers threw rocks at the buses injuring eight of the girls, explaining that some of them were directly hit with the stones while others were injured by the flying glass. He said that the other girls were panicked and were all taken to nearby Hawara town for treatment. Daghlas said that the busses, returning on a trip from Ramallah, were badly damaged in the attack. A 12-year-old Palestinian child was injured in his head after Jewish settlers from Kiryat Arba attacked Palestinian citizens in Jaber suburb east of the Ibrahimi mosque in Al-Khalil on Sunday night. Eyewitnesses said that the Jewish settlers threw stones and empty bottles at young men and children while playing soccer in the suburb injuring the child Saad Jaber. They said that two hours of confrontations then erupted in the suburb and the Israeli occupation forces sealed off the entire neighborhood and banned traffic and movement of citizens. Jewish settlers attacked a number of Jerusalemite families in Hush Al-Shawish in the Old City of occupied Jerusalem on Sunday evening triggering confrontations between the two parties. Locals said that the settlers provoked the families into arguments that developed later on to fistfights and squabbles. They said that Israeli occupation forces arrived to the scene and rounded up five Jerusalemites including a young woman and a youth and his father.